Organization (TPO) is recognized as the official transportation planning agency for Roanoke, VA urban region as required by federal law. In order for the region to to receive federal funds for use on highway, transit, non-motorized, and multimodal systems, the TPO is required to develop a Transportation Improvement Program (TIP). The Transportation Improvement Program (TIP) is a four-year financial program that describes the schedule for obligating federal funds to state and local projects. The TIP contains federal funding information for all modes of transportation including highways, transit and pedestrian facilities. Additionally, the TIP also reflects projects and priorities identified in the Long Range Transportation Plan. The TPO works closely with the Virginia Departments of Transportation and Rail & Public Transportation, as well as local transit operators, to update and amend the TIP each year as funding conditions change. The TIP also has an active public involvement process. 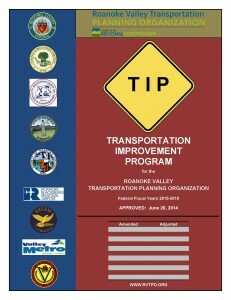 The RVTPO staff developed A Basic Guide to the Transportation Improvement Program, which is a document designed to provide the general public an understanding of the TIP and the process. Finally, the RVTPO publishes an annual listing of TIP projects which have been obligated federal funds. All of these documents can be found by clicking on the links below. Thank you for your comments and participation in the Transportation Improvement Program update process. Since its adoption, the FY15-18 TIP has been formally amended and administratively adjusted to reflect project changes in the document’s narrative. Click the link below for the most current version of the TIP. On June 28, 2018, the Roanoke Valley Transportation Planning Organization Policy Board approved Amendment #2 to the FY2018-2021 Transportation Improvement Program (originally adopted April 27, 2017).